BELFAST, Northern Ireland, 2018-May-07 — /Travel PR News/ — The George Best Belfast City Airport Community Fund has provided financial support to a new arts centre and café that has opened in Crawfordsburn this week. 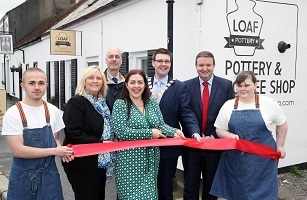 Loaf Pottery, run by social enterprise NOW Group, will secure jobs and opportunities for people with learning difficulties, as well as holding arts classes, providing a space for community groups and operating as a café. Five new jobs have been created in the pottery, with two of these roles going to people with learning difficulties. The pottery will see artists work alongside people with disabilities to develop skills that will increase their employability. Local artists will also be able to use the space to promote their products and support economic development in the coastal area. Loaf Pottery is located on Main Street in Crawfordsburn on the site of the former Pinewood Pottery. NOW Group secured funding from Ards and North Down Borough Council, Ulster Garden Villages, the Coastal Communities Fund and Belfast City Airport to renovate the space after being contacted by local residents who were keen to see the pottery restored and open to the community again. “The Pottery has been in the pipeline for a number of years and it would have been easy to let it pass but the passion and determination of the local residents have supported NOW to make this happen. ““Belfast City Airport is thrilled to have been able to support this fantastic project, which will provide jobs and a wide range of opportunities for the local community. It is great to see how the space has been renovated. “At the airport, we have a dedicated Community Commitment Plan which aims to enrich and support our local community, protect our environment, invest in our people, and help young people realise their aspirations and potential. This entry was posted in Airports, Arts and Culture, Society, Travel, Travel Management and tagged arts centre, Loaf Pottery, Maeve Monaghan, NOW Group, Stephen Patton, The George Best Belfast City Airport Community Fund. Bookmark the permalink.